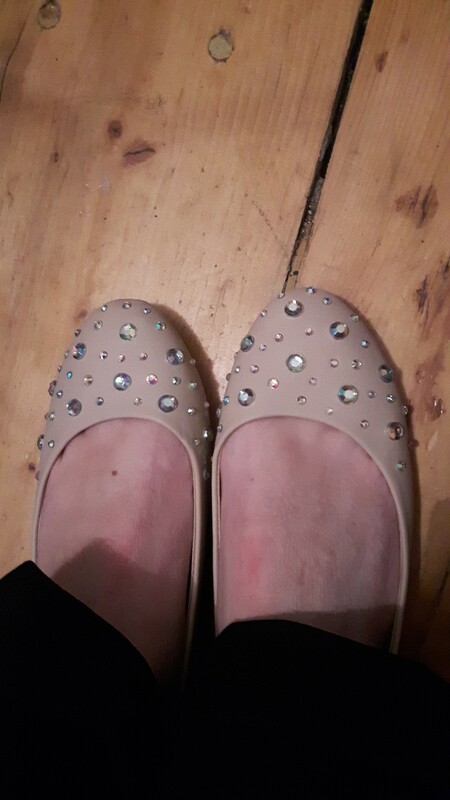 So in a few weeks (far too soon in fact) I will be performing in our annual Strictly show where I will be dancing the waltz with my ‘celebrity’, who up until Nov/Dec time had never danced before… my partner is shorter than me and so I am most likely going to end up wearing flats instead of heels for the show. 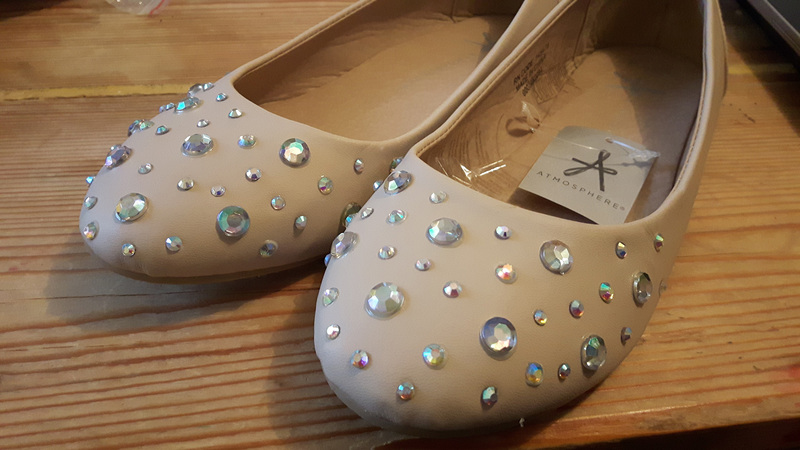 In practice I always wear my jazz trainers… but they are quite clompy and black, so don’t exactly fit in with my nice ballroom dress, so I decided lets make some flats a bit more glamorous! This tutorial would really apply to any sort of shoe, although the finish on it might affect how well you can get stones to stick to it. Rhinestones: Now this is largely a personal choice as to which type of rhinestones you use. I always used to use foil back ones and glue them on myself as I thought the hot-fix glue could be a bit rubbish on cheap stones… However I have recently bought hot-fix stones and an applicator because I couldn’t find the stones I wanted in foil backs (for my new dress project) and I was really quite pleasantly surprised with how easy they were to use and how well they appeared to stick on my fabric. Obviously they haven’t been on there long, so we’ll see, but I might be a convert. 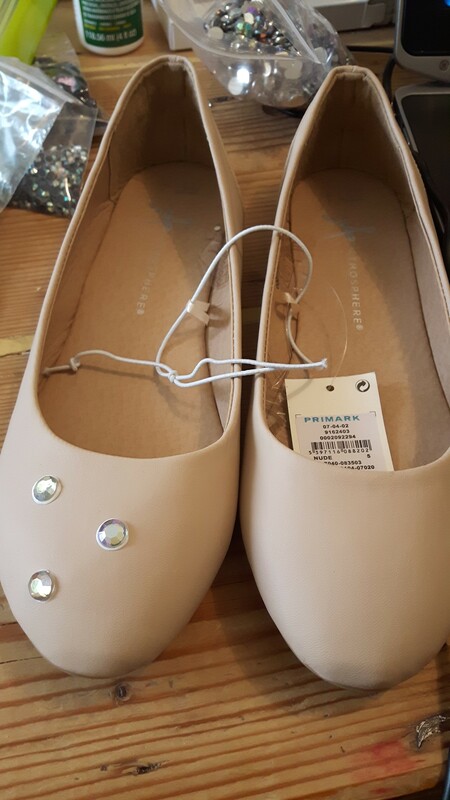 The finish on these is plastic, although not too shiny so the stones should stick okay with the hot-fix. If the surface is too shiny I have read that hot-fix might not work too well and that you should just use gem glue even on the hot-fix gems. 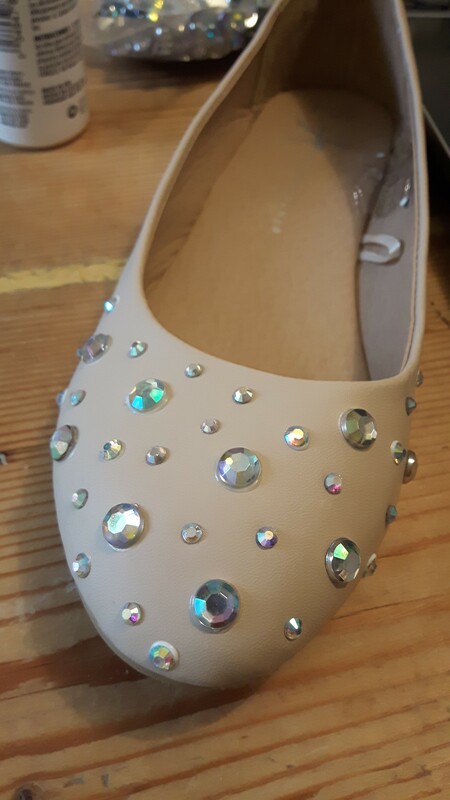 I started off with my largest gems these are 10mm crystal AB ones, so I glues these to the shoes in a fairly loose pattern. I used a little too much glue when sticking these stones on as the surface wasn’t very absorbent so the glue just splurged out a bit, be careful of this if your glue doesn’t dry entirely clear! Use your tweezers to pick up the stones and dab the glue on, then I press them onto the position again using the tweezers. The large stones are done. Theoretically you could just cover your shoes in one type of stone and they would probably look quite nice, but I wanted a bit of variety. So I had a few other sizes of stone to add as well. 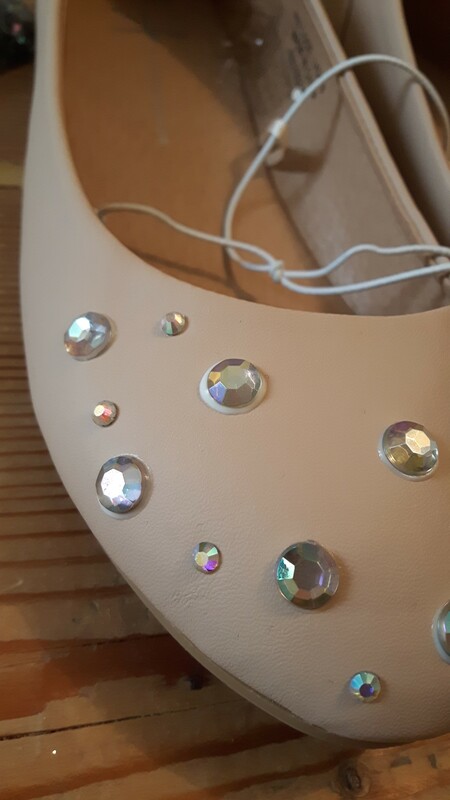 Then I started adding smaller rhinestones in between the large stones. I started with 4mm (SS16) hot-fix stones and 3.2mm (SS12) stones. Both of these stones were hot-fix application. When using the hot-fix stones there are a few methods, some say to pick up the stone with the tip (they come with different sized tips), and when the glue has melted then press it down on the surface. 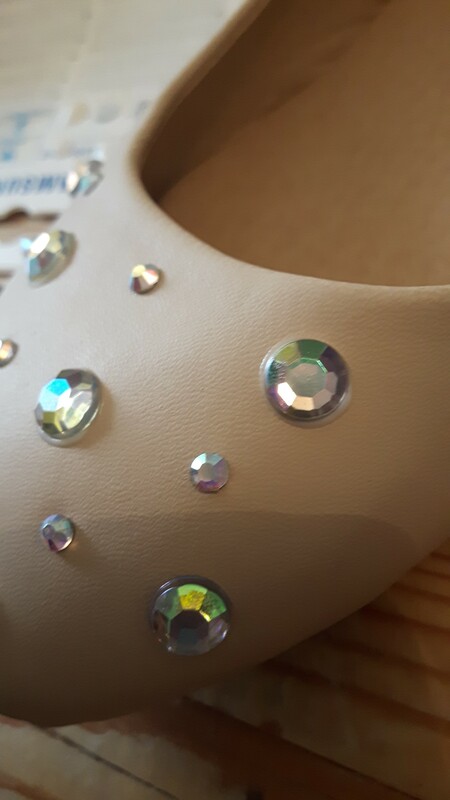 But I find that method difficult to do with some stones, they either drop out of the tip or get stuck in there sometimes, so instead I position the rhinestone on the surface and press the tip on it until the glue has melted. 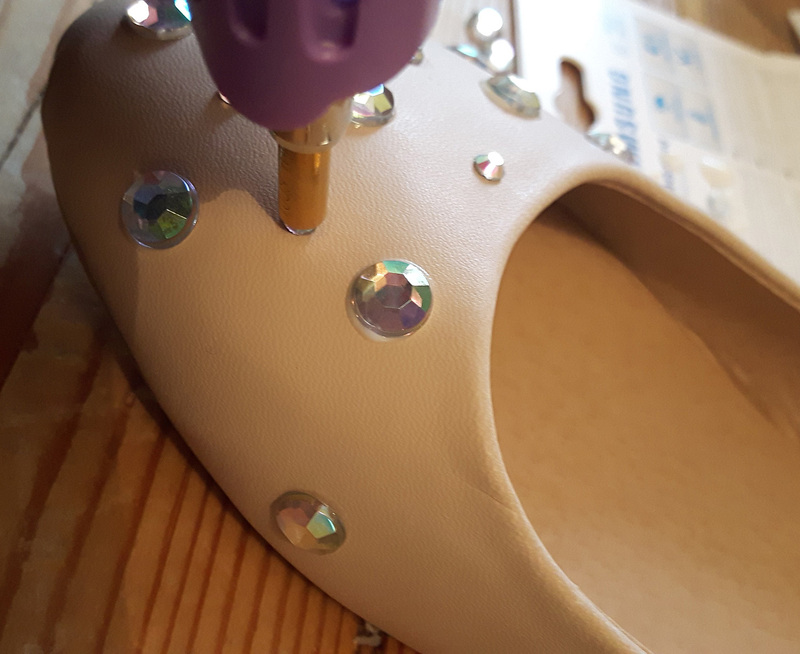 This takes a bit of experimentation so that you know how long the rhinestones take to melt the glue but if you use the flat tip it means you can do multiple sizes without having to change the tip! Then I used some more different sizes in between the larger stones. 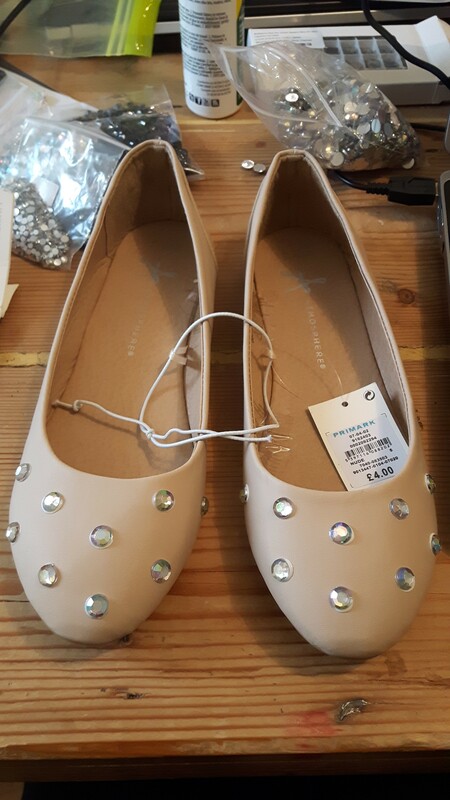 Also I obviously repeated the same stoning on the other shoe… Although they aren’t exactly the same as that would just be really complicated to do. Here they are finished off! I’m actually quite pleased with how they have come out. 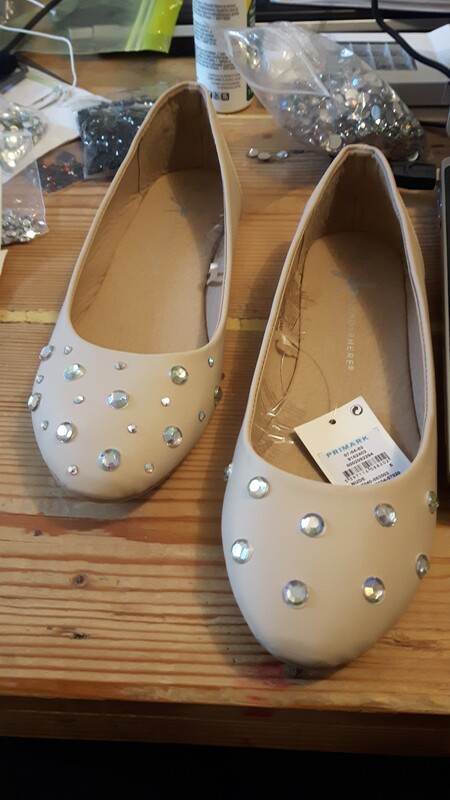 I will still need to add some form of fastening to it to keep the shoe on my foot, but I hope that won’t be too difficult. All ready for a little bit of sparkling under my dress, and the rhinestones seem to be sticking on very well at the moment! 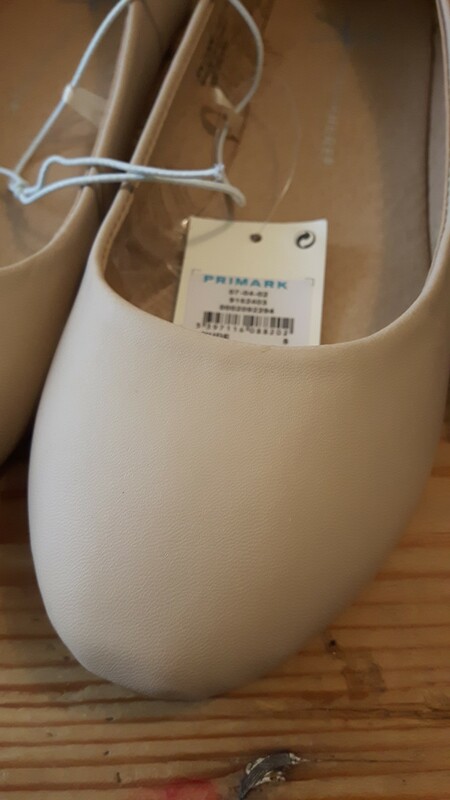 Fab shoes! Good luck with the dancing.